During the 2nd year of studies, a group of us undergraduate composers wanted to do something public, something outside the building of the Faculty and the famous thirtythree [room Nº33, where composition classes were (and still are) held]. 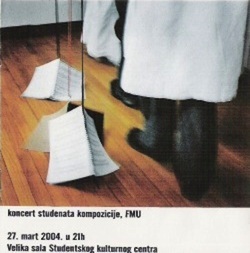 So, in March 2004, with a lot of enthusiasm, will and hope, without any budget, but with great help from those wonderful people from SKC Belgrade, and our amazing friends musicians, we organised a concert we named izvodimo se! (which meant both: we are performing our music i.e. acting out, and: we are taking us / our music outside). 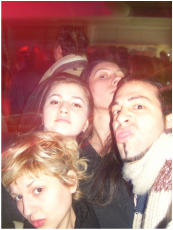 Us as a part of an official program of SKC Belgrade in Skopje, Macedonia. with our friend, fantastic violinist Svetlana Ceca Jelić. ... all that with the same amount of enthusiasm, positive spirit and enjoyment.